This section shows statistics about recent deliveries - how many deliveries there were, how many were refunded, and what the next charge is that you owe and when it's due. This charge includes both tips and delivery fees. You can also use the 2 links to view reports about deliveries and charges. This setting allows you to set an amount of the delivery fee that the restaurant will pay; you can either set one amount and use that for all orders, or you can have it vary by order size or order time. If you want your fees, as well as the customer's fees, to stay standard no matter the order size or time of day, simply fill in the portion of the $9.50 that you want to cover. You may want your fees or the customer's fees to change based on the size of the order. For instance, you might decide that for bigger orders, you are willing to pay more of the fee, taking away some of the onus from the customer. The conditions are set as minimum and maximum subtotal amounts (i.e. not including taxes or tips). Here the restaurant will contribute $1.50 (the customer will pay $8.00) for orders from $10.00 to $19.99, and $3.00 (the customer will pay $6.50) for orders from $20.00 to $29.99, and so on until the restaurant covers the entire fee for orders of at least $60. This section allows you to contribute toward the delivery fee based on the price of the order. For instance, you might want to encourage orders at a certain time of day that is not busy, so you could add a contribution toward the delivery fee during those hours. This section is a calculator which lets you experiment with different delivery prices, days, and times, and you can see what you would pay and what the customer would pay toward the delivery fee. 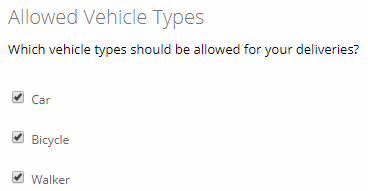 This section lets you choose what types of vehicles DoorDash will be allowed to use to deliver your orders. And remember, after changing any settings, be sure to click the "save" button at the bottom of the page! If you need additional support with Open Dining Delivery, please reach out to our support team.